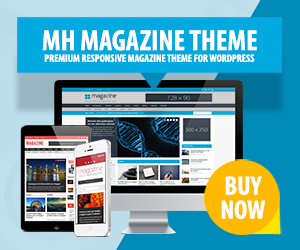 With over 600,000 theme downloads and customers in more than 110 countries around the world, MH Themes offers some of the most popular magazine themes for WordPress. In order to run a successful WordPress theme business, it’s not only important to offer high-quality and reliable WordPress themes, but also excellent theme support to keep customer satisfaction on a high level. In this article you’ll learn more about the support options we offer to our customers. In addition to the quick and helpful support by our support staff, we’ve also published several tutorials and articles with additional information about our WordPress themes or WordPress in general. You can find these resources in our support center. What about Updates and Support after License Expiration? After your license for updates and support has expired, you may of course keep using your themes without additional cost as there is no limitation to that. In case you want to receive updates and support after your support license has expired, you can renew this at any time with a 25% discount. The renewal won’t happen automatically and is fully at your own discretion (no subscription!). We also have the MH Themes Lifetime offer which contains all premium WordPress themes by MH Themes including lifetime updates and support. MH Themes Lifetime comes especially handy if you run several different websites at a professional level with the need of some new awesome WordPress themes and reliable theme support. MH Themes Lifetime offers full flexibility for your website with our growing collection of high-quality Premium WordPress Themes! In case you need additional assistance with the installation of your new WordPress theme by MH Themes, we also offer a reliable installation service where we will install your theme and reproduce the layout of the theme demo to get your site up and running in no time. In order to prepare everything for the theme installation, you’ll need to have a hosting plan (in case you are still looking for a hosting company – we can recommend a few reliable providers for WordPress hosting) and a working WordPress installation ready for us. If you need theme customizations, custom development or other services related to your WordPress website, we usually can provide you with a free quote based on your requirements to get the job done to your satisfaction. You can always contact us in case you need anything else. Hello, I want to have news magazine and I think your WordPress theme will serve my purpose but how easy will it be for a novice like me to set up the website on my own? Thanks. Hi Ayo, thanks – we’re very happy that you like our magazine WordPress themes. If you’re familiar with WordPress basics, you usually shouldn’t have issues to configure your website as this only requires a few simple steps and there also is extensive documentation available. And in case you’re not yet familiar with WordPress and don’t want to install and configure the particular WordPress theme by yourself, then we also offer an additional installation service where we can install and configure the theme for you with the layout of the theme demo. Most regular users are not WordPress professionals, so that usually isn’t an issue at all as it’s learning by doing while using WordPress and doesn’t take long to learn. For some inspiration you could have a look at our showcase where you can see how other users have configured their websites and there users also have shared their experience with our WordPress themes.